On fewer handles and more system bending – OffBrand. 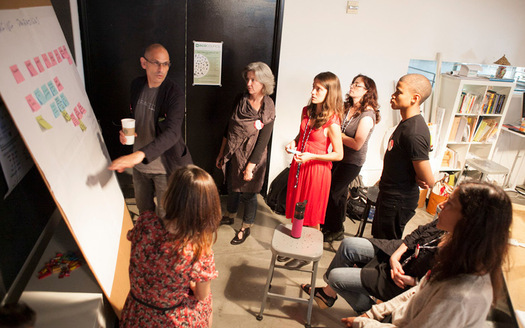 Thought 1: Shaping Design Education at LEAP Symposium may have been very good. A few too many post-it notes, a few too many kooky documentary illustrations, but that aside, it may have been a well considered, far-thinking event. I’ve read the article, looked at the pictures, and of course broadly agree with the summary, it being so general that it would be difficult to disagree with. ‘Humility’ and ‘optimism’ are advocated as key qualities, (but of course, who wouldn’t agree with humility and optimism in their broadest senses?) and as anyone who knows me will testify, I have at least one of these things in spades. But there’s something not quite right, something that is *annoying* me. Thought 2: I think perhaps this conference just crossed my path at the wrong time. Its possible I’m really frustrated by something else, and maybe it’s this; In Higher Education this type of thing seems to increasingly happen. Didactic initiatives keep cropping up to makes students be more sustainable, more employable, more ‘responsible’. Its undeniable that the academy now has a far stronger view, (and often goes to much greater lengths to realise that view) of what it’s graduating students should ‘be like’. In the same way that conferences about ‘creativity’ seem to miss the point, a scheduled agenda about any of these big issues seem doomed to do them a disservice. I’ve been thinking about this a lot lately in relation to some events I’m working on next year, loosely political in nature. But we can’t make people be ‘political’ or act ‘politically’. For that to have any value, it needs to come from the person, at the right time in the right place – to genuinely ‘respond’. The most we could/should do is create a platform for that to happen, which is in itself a political act enough. And it should be the same in education. Creating spaces – encouraging, supporting, challenging spaces – designed from the person or cohort outwards, not from a socio-economic political endpoint backwards. Capital likes to know what it’s dealing with. Projects of the ‘what’s to be done about’ variety, while probably well intended, try to offer people too many handles on things, and at the same time set up too many fences around things, and (if you’ll indulge me in this triple-metaphor-a-thon), easy ‘pidgeon-holing’. Discussions about education, creativity, sustainability etc should come about as a by-product of doing other things, and be constantly open to revision, making things, abject failure, making things, delighting in specifics, making things, letting things not be named, and contrarian views. Thought 3: This reminded me of another post I have never got around to writing. Celebrating ‘system bending’ – people and groups who can navigate, but more importantly ignore, subvert and generally distract from the prevailing meta-narrative of quantifying, modularising, commodifying, systematising (and yes, even understanding) contemporary creative life. Let’s try and learn more, understand less. Previous Previous post: Less War War, More War War.